Hey Folks Out There, it’s an especially good day. You’ll love this husband and wife theory. Husband (me) tends to book his life super full and is always whisking around, trying to fit it all in. Wife (Stef) knows this insanity oh too well and because she’s the one with wisdom in the house, books said husband a fake session and doesn’t tell him that it’s not really happening until the day of. Thus, happily, a day to catch my breathI’m loving it, thanks Stef! Solas is on the box decorating the aural landscape with images of Ireland and I’m writing to you from a slightly more casual place. Here’s what’s up. 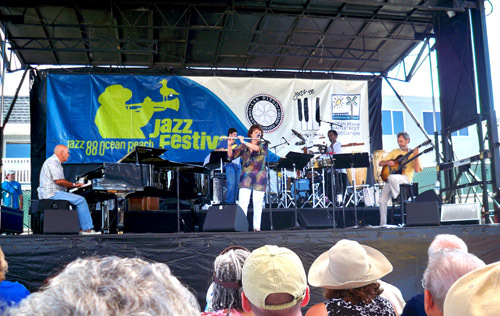 We had a wonderful concert with Brasilia yesterday at the OB Jazz Fest. It was a classic hang right in the heart of town next to the pier and the ocean and all of the colorful folks drifting along the walkway. The music was cooking with guest Allan Phillips bringing it strong on percussion. After we played I got to take in Bad Plus’s set and I loved their direction. Whack moments and loads of humor and color. Brasilia at the OB Jazz Fest. From the left in the front, Mike Wofford, Holly Hofmann and Peter. In the back, Kevin Hennessy, Allan Phillips, and hidden behind the cymbals is Duncan Moore. Photo by Steve Schisler. I’ll be continuing the North County revolution at the Roxy on Thursday eve playing solo guitar. I love this setup! 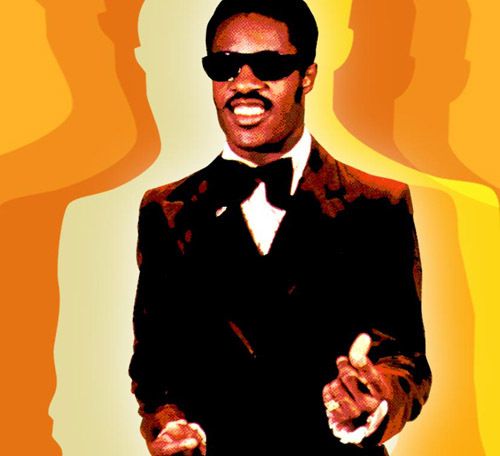 On Friday we’re coming together to play the music of Stevie Wonder. The concert will be held at the first rate theatre at the Canyon Crest Academy in Carmel Valley. Earlier this year we played a show there with my String Consort group and the hall is exceptional in every way. For this concert we’ve got a stellar band and our direction is bringing a jazz and Brazilian influence to the amazing Stevie Wonder songs that we’ve grown up with. Most of Stevie’s music flows from a jazz harmonic perspective so it’s a natural fit heading even more towards jazz with his tunes. We’re playing Sir Duke, Love’s In Need of Love Today, You and I, That Girl, Creepin’ and many others including a strange morph of I Wish blending into Coltrane’s Resolution. I can’t wait and I hope you can make it out to take it all in. Look below for the details. 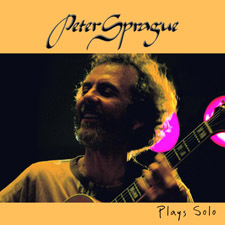 Peter Sprague  guitar 7 PM Playing solo guitar at North County's Transcendental Factory. Leonard Patton  voice 7 PM Heading south for a concert with the one and only Leonard Patton. Gregory Hutchinson  drums 8:15 PM Heading back over to play with the wonderful Dianne Reeves and band in Europe. Gregory Hutchinson  drums 9 PM Heading back over to play with the wonderful Dianne Reeves and band in Europe. Gregory Hutchinson  drums 8 PM Heading back over to play with the wonderful Dianne Reeves and band in Europe. Gregory Hutchinson  drums 10 PM Heading back over to play with the wonderful Dianne Reeves and band in Europe. Gregory Hutchinson  drums 7:30 PM Heading back over to play with the wonderful Dianne Reeves and band in Europe.